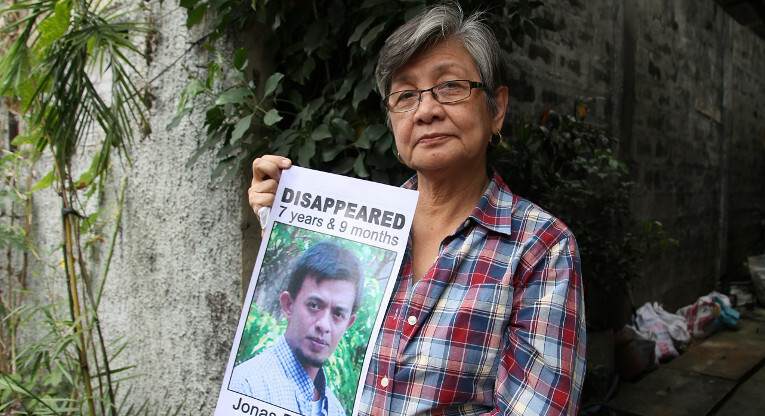 Front page › Latest news › Blog › Why is Jonas Burgos still missing? Why is Jonas Burgos still missing? On International Day of Social Justice, NCCP remembers the victims of enforced disappearances. During 2010-2014, altogether 21 persons have been victims of enforced disappearances in the Philippines. * The Court of Appeals has ruled that the military and government are responsible for these cases. Jonas Burgos was abducted in April 2007, almost eight years ago. Why was he taken and why is he still missing? On the way to meet Jonas’ mother Edita Burgos, I thought: What can you say to a mother who has lost her son? But Mrs Burgos is used to speaking about the most painful part of her life. She has worked hard for years to find her son – but in vain. I have googled on Jonas’ case before and after the meeting and there’s no shortage of information. There’s even a movie and a book. Farmer-activist Jonas Burgos is the Philippines’ best known deseparecido. His father, Joe Burgos, was a figurehead of press freedom. After graduating with Honors degree in Agriculture, Jonas wanted to get to know the life of a farmer and went to live on the family’s farm in Bulacan. His connections to the New People’s Army there are believed to be the reason of the abduction. “One Saturday, Jonas did not turn up for a family meeting. He did not send any message nor answer his phone. This was not like Jonas,” Mrs. Burgos recounts how the family first learned that something had happened. Next day, when Jonas picked up the phone, his voice was weak and his speech slurred. “And his answers didn’t make sense. He told me he was with a friend who used to live near camp Aquinaldo, but I knew the friend had moved overseas. He also said he had taken a bath. I think he wanted to tell me that he was with the military and that he had been tortured”, Edita Burgos says. The strange phone conversation was the last she heard of Jonas. The family decided to call a press conference and announce him missing. Shortly after, an eyewitness called to say that he had seen Jonas abducted at the Ever Gotesco mall in Quezon City. Slowly, the picture of what had happened started to form. Edita Burgos, who had wanted and enjoyed a life of anonymity beside her famous husband, decided to become the family’s spokesperson on Jonas’ case. She was terrified of the publicity, but did not want any of her other children be the next victim. Over the years, she has done everything there is to do to find her son. In 2008, with support from Finn Church Aid’s Philippine partner the NCCP Mrs. Burgos brought Jonas’ case to the UN Human Rights Council, as well as to churches and government bodies in the United States. She has tirelessly advocated for Jonas’ surfacing in the Philippines. In 2013, the Court of Appeals found the military and police responsible for Jonas’ abduction. But they still deny they had anything to do with it. “The Army should follow the orders of the Supreme Court and surface Jonas. It should investigate sincerely and clean up its ranks. Now the army is saving the institution with the cost of human lives”, Edita Burgos says. “The President is the Commander in Chief, but he hasn’t given a definitive statement. This fosters impunity”, Edita Burgos says. This is my prayer, too. Surface Jonas Burgos. Because, firstly, no matter what he has or has not done, this is just wrong. If you do something criminal, you are taken to court and if you are found guilty, you get a sentence determined by the law. You do not “disappear”. Secondly, Jonas became an activist because he kept his eyes open. There is a lot of social injustice in this country. You can choose to not notice or care, but Jonas noticed, cared and also acted to make things more just. As Edita Burgos told me, social injustice is where anger and war start. But of course there are those who profit from injustice and want to keep things the way they are. Is this why people, who want to help the poor to change their lives for the better, are persecuted? They should be respected and supported by their government in their struggle to make the society more just. Isn’t it ironic, that the Philippines is the first country in Asia to criminalize the practice of enforced and involuntary disappearances (in 2012)? According to for example, Human Rights Watch, the Aquino administration, however “has not made significant progress on its pledge to expedite the investigation and prosecution of extrajudicial killings, torture, and enforced disappearances”. They are afraid to tell the truth. Who is afraid of whom? Isn’t it alarming, that in Jonas’s case, no arrests have been made, even though the key players have been identified? Even the major, who abducted Jonas, has been named. “Start with yourself, what you can do. Jonas was very poor financially, but he would give away his shirt, if he did not have anything else. We have social justice when everyone who is part of a society is able to live as a dignified member of it. This should be the aim of all governments”, Edita Burgos concludes. Ulla Kärki työskentelee tiedottajana Kirkon Ulkomaanavussa.